Recently, I saw an article floating around Facebook and the internet about Original Dawn Dish Soap and all its benefits ... from using it in your garden to your skin and your hair. This article even said it's biodegradable! What? Are you kidding me? I know we shouldn't believe everything we read, but I know some people out there are probably buying Dawn right now and that's just crazy. All I could think is why do people use Dawn to kill their weeds if it's safe and natural? 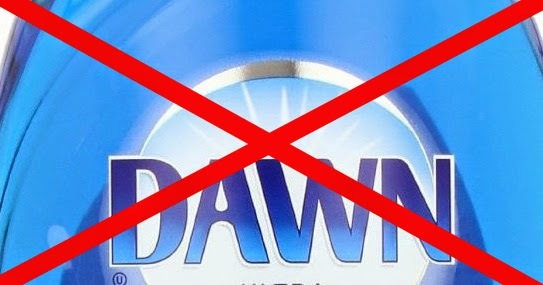 Knowing that Dawn was not a great dish soap, I wanted to know the facts. I was surprised to learn that Dawn doesn't even list it's ingredients on the bottle. If it's so great, what are they hiding? Without even looking at a label, you can see that it has added dyes and synthetic fragrances, neither are ever good or natural! The Environmental Working Group gave Dawn a 'D' grade because of it containing methylisothiazolinone, which is a "High Concern: acute aquatic toxicity; Some Concern: skin irritation/allergies/damage". Sounds delightful, right? Dawn also contains 1 4-dioxane which is considered a groundwater contaminant. Knowing that Dawn should not the the soap for anyone, I wanted to know what is. I found that many dish soaps, even ones that claim to be 'natural', 'chemical free' and 'made from plants' have the preservative methylisothiazolinone. It is exactly that, parts and in some cases, most of the detergent may be 'natural', 'chemical free' and 'made from plants' but not all of it. So, what exactly is methylisothiazolinone and should we be concerned? It is an antimicrobial and preservative in the form of a soluble concentrated liquid or solid that is used in a variety of applications, such as personal care and cleaning products. According to the EPA in the 1998 document, "Reregistration Eligibility Decision, Methylisothiazolinone", Methylisothiazolinone is a highly corrosive chemical that has been found to be toxic when ingested, inhaled, or applied to the skin or eyes in animal studies." I was surprised to see that even Earth Friendly Products, Ultra Dishmate contained methylisothiazolinone! Dish soaps that I see often at the store and would think that they are great actually got 'F's from the EWG. To name a few, Mrs. Meyers and Seventh Generation got very low scores for both personal and environmental safety. Method brand, Green Works, Bon Ami Dish Soap are dish soaps that often claim to be very 'natural' and are anything but ... shame on you all! Mix water and grated bar soap in a pot. Bring it to boil and mix it until the bar soap has completely mixed in. 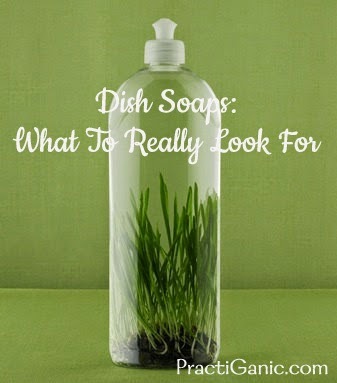 Meanwhile, add your liquid castile soap, washing soda, vegetable glycerin and essential oils to your container. Once your water and bar soap has completely mixed, add it to the remaining ingredients. Mix well. Check out more of my DIY Natural Cleaners too! And please remember, we need to be educated and read labels ... the fine print of the labels is always the most important not what they advertise on the front of the bottle! I feel like after this research, my head was spinning a little and I was remembering why I didn't like chemistry, but I'm so glad I looked into it. I can't say it enough ... don't let the advertisers win, let's educate ourselves to make our homes and families safe! Thank you for this information. It is very helpful! I will try your recipe. I make my own soap powder, using various recipes. So far, they do not seem to clean as well as commercial detergents. I am determined to keep testing and tweaking recipes until the correct combo works for is.